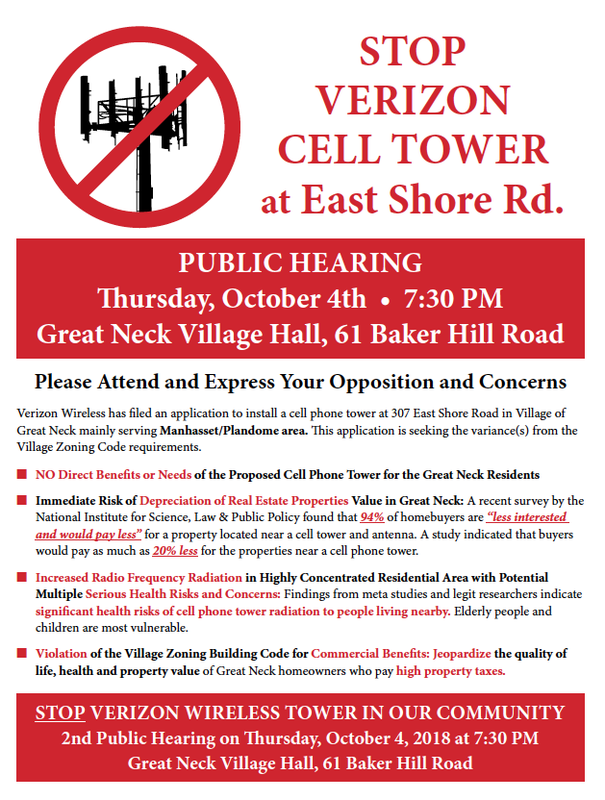 This is the cover of a document that has been circulating among residents who are concerned about Verizon’s plans. Many Village of Great Neck residents are extremely concerned about a proposed cell tower for which Verizon is hoping to secure a variance at 307 East Shore Rd. 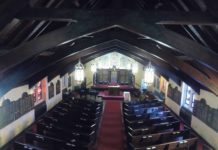 Opponents believe the tower would lower property values, be detrimental to residents’ health and start an avalanche as variances chip away at current zoning laws, opening the door for other businesses to turn the lovely residential area into commercial property—and the tower itself won’t offer any benefit to the community. 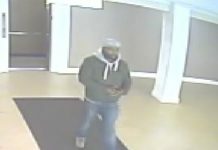 Amato Law Group, PLLC, and Verizon have not responded to requests for information. “Please attend and express your opposition and concerns,” the flyer began. 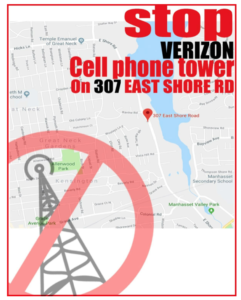 It went on to explain that while Verizon Wireless has filed an application to install a cell phone tower in the Village of Great Neck, it will mainly be serving the Manhasset/Plandome area, which will have no direct benefit for Great Neck residents. Concerned community members have been circulating this flyer to promote attendance at the meeting. The second bullet point warns, “Increased Radio Frequency Radiation in Highly Concentrated Residential Area with Potential Multiple Serious Health Risks and Concerns,” noting, “Findings from meta studies and legit researchers indicate significant health risks of cell phone tower radiation to people living nearby,” with elderly people and children most vulnerable. This sign was put up around the village to promote attendance at the meeting. The first hearing about the tower was held on July 12. 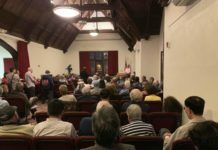 Residents have been circulating a copy of a letter dated June 22 that only a select few, living closest to the proposed tower, received from the Incorporated Village of Great Neck Zoning Board of Appeals, notifying them of that first meeting—and are outraged that the majority of the community was not alerted. They feel that it was very secretive and sneaky. During the first meeting, an attorney, an architect, an engineer and a real estate analyst discussed the impact of the proposed tower. The Great Neck Chinese Association has been publishing information about the matter through digital weekly newsletters throughout the summer and the Chinese community has been actively discussing the proposal via the Allenwood WeChat group. Wang, one of around 300 people active on the Allenwood area WeChat group, which is primarily conducted in Chinese, said that residents formed an informal committee to stop the tower. 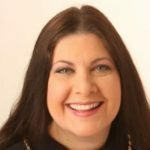 The second meeting was originally on the Village of Great Neck Zoning Board of Appeals agenda for Thursday, Aug. 2, but was adjourned until Oct. 4. The proposal is listed as Case No. 2490: 307 East Shore Rd., also known as Section 2, Block 348, Lot(s) 64 and 65 on the Nassau County Land and Tax Map, located in the Mixed Use Zoning District. Eric Helman, of the Amato Law Group, representing Verizon, is seeking the following variance(s) from the Village Zoning Code in connection with the roofmounted public utility wireless communication facility application, §575-119 D: The maximum permitted building height is 31 feet or three stories. The proposed building height is 51.25 feet and four stories. Variances of 20.25 feet and one story are required. Evelyn Huang, a new mom who moved to the area a couple of years ago, learned a lot from the experts who spoke at the first meeting and is against the proposal. Next articleEditorial: Whose Idea Was This? Same idiots will be complaining about bad service and wonder when Verizon will fix it. Um….DUH Also LOWER property values. Sorry Luddites but having good cell service will INCREASE your property values. Same dolts worried about “radiation” go outside without sunscreen where they are getting thousands of times more radiation from the sun. Do you work for Verizon? Thank you for reporting this story, Sheri. My family lives close to the proposed tower. I am very concerned of the long-term impact of the cell phone tower to the health of my 5-year old and a new born baby. we love this community but have to sell our house if the tower is approved to be built. It is frustrating that Verizon kept postponing the hearing. I hope Verizon withdraw the application. A company has social responsibilities and should do “no evil” to the sociaty. 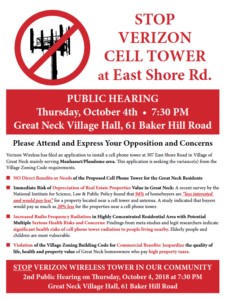 It is evil to build a high frequency cell phone tower in such a dense residential area. It would be an absolute mistake if this tower isn’t built. People in great neck, especially in the Kings Point area have been suffering from poor connection and signal strength for years. This tower is only meant to help reception in Plandome and Manhasset, not Great Neck.